Place chicken breasts between 2 pieces of wax paper and, using a meat mallet, pound to an even ½-inch thickness. Mix all ingredients except chicken together in a 1 gallon zip-lock bag. Add chicken breasts and massage marinade into meat until evenly coated. Seal the bag and place in a bowl in the refrigerator (the bowl protects against leakage); let the chicken marinate at least 4 hours or up to 12 hours. Clean grill and preheat to high. Lightly dip a wad of paper towels in vegetable oil and, using tongs, carefully rub over grates several times until glossy and coated. 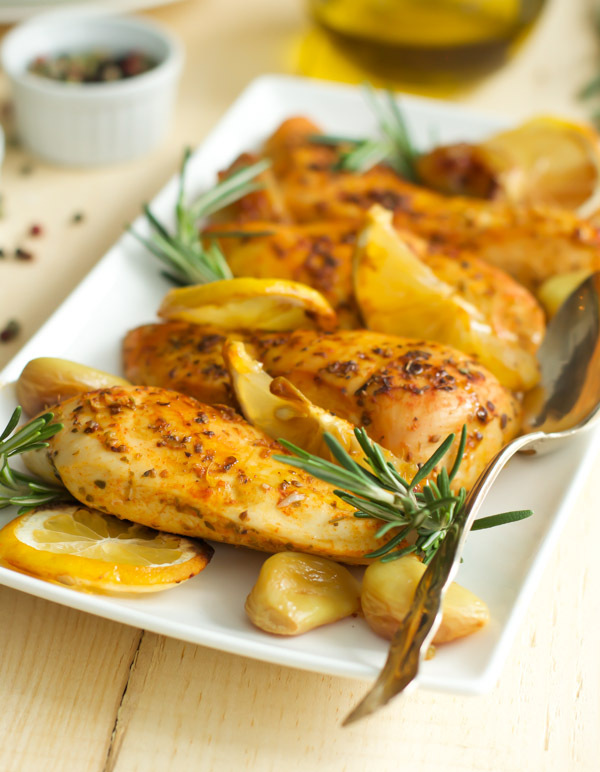 Place chicken breasts on the grill (make sure they are well-coated with the marinade; the more garlic, lemon zest and herbs on the chicken, the better!). Grill, covered, for 2-3 minutes per side. Enjoy !